It has only been one day since beloved Star Wars icon Carrie Fisher passed away, which came just days after the actress suffered a heart attack on an international flight between London and Los Angeles. Since then, tributes have started pouring in on social media for the Star Wars legend, as fans around the world continue to mourn this tragic loss. Today we have a new report which sheds some light about what will happen to the actress' beloved pet, a French Bulldog named Gary Fisher. 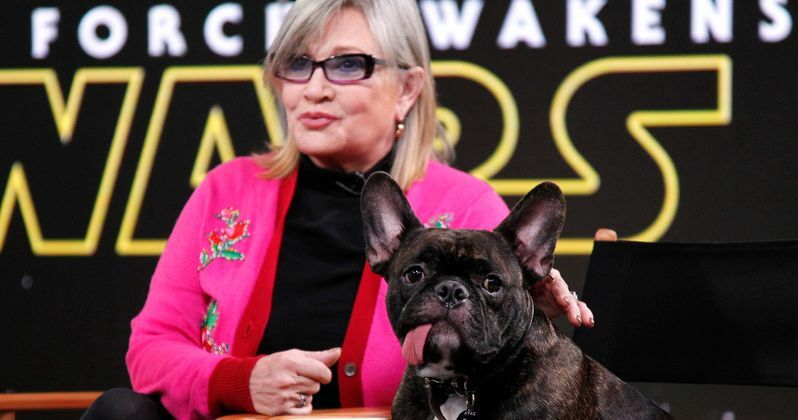 Over the past few years, Carrie Fisher's dog Gary has developed quite the following, with the actress taking the dog practically everywhere with her, including on the stage of Star Wars Celebration last year. The faithful pooch was even with his owner on Friday, December 23, when Carrie Fisher suffered a heart attack, just minutes before her flight landed in Los Angeles. Now that the actress has passed, TMZ reports that Gary Fisher will be cared for by the actress' daughter, Billie Lourd. Billie Lourd, who starred along his mother in both Star Wars: The Force Awakens and the upcoming Star Wars: Episode VIII, already owns her own French Bulldog named Tina, who is reportedly "best friends" with Gary. Sources close to the family reveal that Carrie Fisher had always wanted her daughter to take care of Gary, if something were ever to happen to her. If, for whatever reason, Billie Lourd doesn't take care of the dog for the long term, the pooch will still stay in the family with an unidentified family member. Carrie Fisher adopted the French Bulldog Gary four years ago, as a service pet to help the actress cope with her bipolar disorder. Over the past few years, Star Wars fans have seen quite a bit of Gary Fisher, with the dog spotted in photos from the set of Star Wars: The Force Awakens, alongside his owner at Star Wars Celebration and even tagging along in press interviews as well. The pooch has become a fan favorite in the lead-up to Star Wars: The Force Awakens, and he even has his own Twitter account, with more than 57,000 followers. Billie Lourd, who was the only child of Carrie Fisher and talent agent Bryan Lourd, made her feature film debut in Star Wars: The Force Awakens as Lieutenant Connix, a role she will reprise in Star Wars: Episode VIII. She will reportedly have a larger role in Star Wars 8, but no details were given about how her role as expanded. She also stars in the hit Fox series Scream Queens, and has another movie entitled Billionaire Boys Club in post-production.